Now 75% off in our Outlet! A slice of pure natural soap, cut from one of Labyrinth's handmade soap loaves, wrapped in tissue, and badged with the labyrinth wax seal. 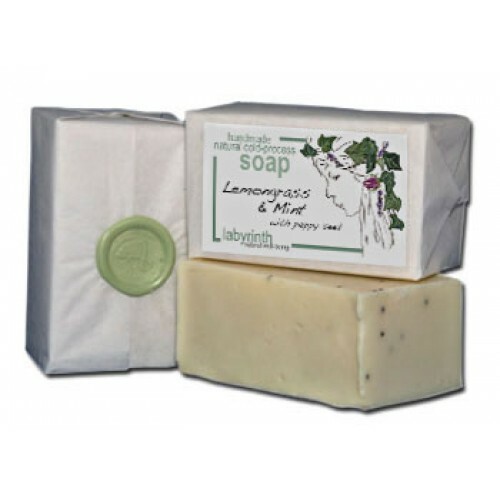 The fresh, stimulating fragrance of Lemongrass and Mint makes it ideal for use after sports or exercise. Their antiseptic qualities can aid relief from skin complaints such as dermatitis and acne as well as easing the symptoms of muscle pain, stress, nervous exhaustion and fatigue. Olive Oil (Sodium olivate), Coconut Oil (Sodium cocoate), Regulated Palm Oil (Elaeis guineensis), Spring Water (Aqua), Lemongrass (Cymbopogon schoenanthus), Spearmint (Mentha viridis), Poppy Seeds (Papaver somniferum). Naturally Occuring: Eugenol, Citral, Geraniol, Citronellol, Limoene, Linalool. Labyrinth handmade soaps contain only pure, natural products. No artificial chemicals, preservatives, animal fats or animal derivatives whatsoever. They use finest quality butters and oils to produce a soap that not only cleans but leaves your skin feeling refreshed, moisturised and invigorated. They only use palm oil that is sustainably sourced.